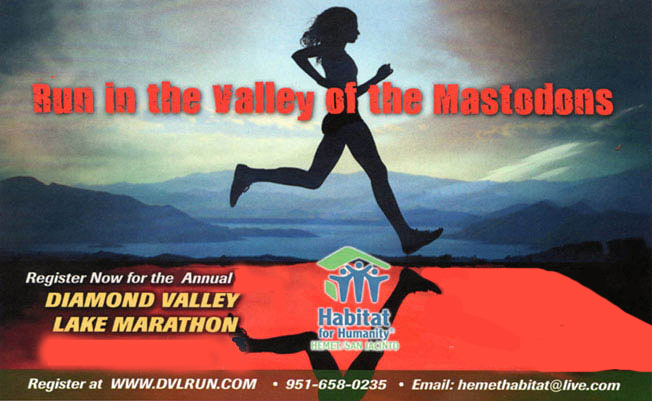 The 16th Annual Diamond Valley Lake Marathon, Half Marathon, 5K Walk/Run, 1K Kid Walk, Senior Walk/Run is held at Diamond Valley Lake Marina, 2615 Anglers Avenue, Hemet, CA 92543 on March 3, 2018. These races will benefit the Habitat for Humanity Hemet San Jacinto Affiliate. There is a 1,000 runner cutoff, so register early. All entries submitted after the maximum number will be returned. Click here for more information; also for race results after the race. This entry was posted in Marathons, Sports. Bookmark the permalink.